A direct daughter of the popular Select Sire and 44 Farms sire War Party, stemming from a GAR Predestined daughter working in the 44 Farms and RD Cattle Company joint embryo program. Ruby 2121 ranks in the Top 1% of the breed for CW and REA, Top 5% for WW, YW and $B. 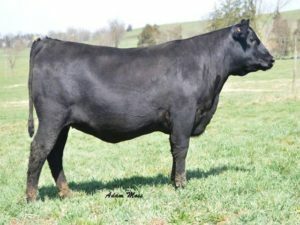 Ruby 4068 is sired by the Select Sires and 44 Farms sire Connealy Capitalist 028 by a direct daughter of the now-deceased REA matriarch B/R Ruby 1224. The first progeny of “4068” to sell at auction averaged $12,000. 4068 Ranks in the Top 1% RE, CW and $W, Top 5% WW, YW and $B. 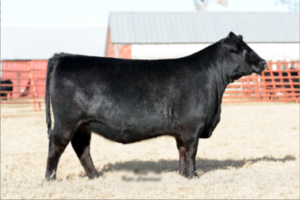 An attractive made daughter of Summitcrest Complete 1P55 by a dam tracing back to G A R Retail Product 1215 that has left her mark on the BJ angus program in Manhattan Kansas. 1287 Ranks in the Top 5% for Marb, RE, Milk, $G and $B and Top 10% for $W, WW and YW. A moderate yet powerful daughter of the record selling EXAR Denver out of the $70,000 valued donor dam EF Rita 2229 working in the Evans Farm and Haley Fairways programs. 4112 Ranks in the Top 5% WW, YW and Top 10% for Marb. 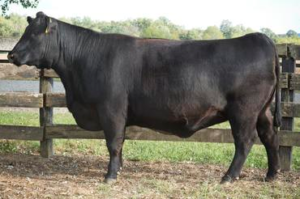 Henrietta 1638 is the featured member of the herd sire producing Henrietta Pride family and she combines the female sire, Consensus 7229 with the $100,000 valued highlight of the Deer Valley and Spruce Mountain Ranch donor, Henrietta Pride 639T. A direct daughter of the Woodside donor Rita 0O3, the Objective daughter of the famous Rita 5F56, sired by the marbling sire GAR Prophet. Rita 3P15 ranks in the Top 1% for WW, YW, CW, Marb, $W, $F and $B. 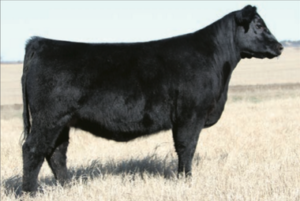 Sired by one of the breeds REA leaders, Rito 9Q13 by a dam descending from the famed G A R Precision 2536 that anchored the Wehrmann Angus donor program. Her dam was a $20,000 feature of the Wehrmann dispersal selling to Woodside Farms. 4416 Ranks in the top 1% of the breed for RE, CW and $B, Top 5% WW, YW, Marb and $F. Rita 4456 is a low-birth daughter of the $3.5 million producer, Rita 5F56 sired by the $300,000 valued Deer Valley Farm and Select Sires roster member, All In. 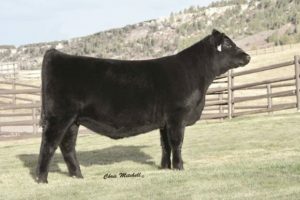 Full siblings include 44 All In 4405, the second high-selling bull of the 2015 Fall Sale at 44 Farms and Rita 5006, the $40,000 selection of Three Trees Ranch in the 2015 Woodside Sale. 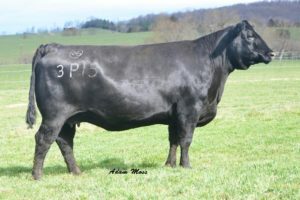 A direct daughter of the now-deceased Express Ranches and Pollard Farms donor Rita U049, and sired by the Accelerated Genetics stand out Ten X. 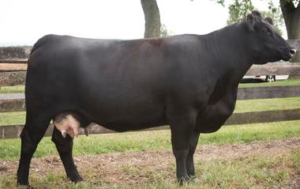 Full siblings include EXAR Hi-Tech the $28,000 resident herd sire in the Edisto Pines program in South Carolina, Rita 4749 working in the Spruce Mountain Ranch donor program and Rita 4756 in the Riverbend Ranch herd. 4750 Ranks in the Top 1% of the breed for CW, $F and $B, Top 5% WW and YW, and Top 10% for RE. Sired by the Express Ranches sire EXAR Denver and produced by the $36,000 dollar selection of Wilks Ranch from the 2014 Angus Night on the Mountain Sale, Spruce Mtn Blackbird 3362. Blackbird 3362 is a direct daughter of the Express Ranches, Fairways Farms Angus and Rimrock Productions donor Riverbend Blackbird T1088. A direct daughter of the $115,000 top-selling fall pair of the 2014 Crazy K sale going to Vintage Angus, Crazy K Lucy V105 and sired by the record selling Express Ranches sire EXAR Denver. 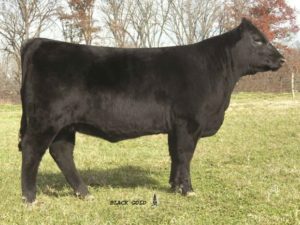 Lucy V105 is a direct daughter of Basin Lucy 3829 sired by the balance trait leader Connealy Consensus 7229. A maternal sister, Lucy 3356, was a $35,000 headliner of the inaugural Crazy K sale selling to Spruce Mountain Ranch. C046 Ranks in the Top 5% $B and $W Top 10% WW and YW. Lucy 5276 is a beautifully designed daughter of the Marb leader GAR Prophet, by a dam tracing back to the 44 Farms, Basin Angus and Express Ranches donor Basin Lucy 3829. Her Ten-X dam posts an individual weaning ratio of 1@108. 5276 Ranks in the Top 1% WW, YW and $W Top 5% WW, CW, Marb, REA, $W and $B. Sired by the $250,000 VAR Generation 2100 by a direct daughter of the now-deceased Deer Valley Farm and Edisto Pines Farm donor Rita 0307, by Ten X. Full sisters to the grandam of 5105 include Rita 0274, the featured Deer Valley Farm and Bridges Angus donor who produced the $300,000 valued Select Sires roster member Deer Valley All In; and Rita 0308, the top selling bred heifer of the 2011 Focused on the Future Sale selected by Vintage Angus Ranch who went on to produce the $110,000 top-selling bull of their 2013 Bull Sale VAR Discovery selected by 44 Farms and featured in the Accelerated Genetics line up. Top 5% $W Top 10% for WW, YW, CW and $B. A direct daughter of the $360,000 valued herd sire matriarch GAR Objective 1885 sired by the now deceased Rito 9Q20. 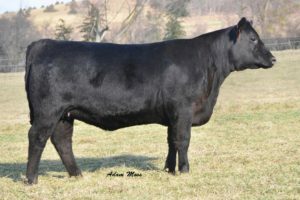 Full siblings of Rita 5504 include the high selling bull of the 2017 Black Gold Genetics sale Rito 9Q20 537 selling for $25,000 to Valley Oaks Angus and Rita 5503, the $15,000 selection of XL Angus in the 2015 Woodside Sale. A direct daughter of the $360,000 valued herd sire matriarch GAR Objective 1885 sired by the ever popular Select Sires rooster member Deer Valley All In. Rita 6007 currently ranks 2nd among all non-parent females sired by Deer Valley All In for yearling growth. 6007 Ranks in the Top 1% for WW, YW, CW, $W, $F and $B. Sired by the now deceased proven $B sire Rito 9Q20, by a dam stemming from the Spruce Mountain and Deer Valley donor Sitz Henrietta Pride 639T. Maternal siblings include Henrietta 5008 selling to ABS Global in the 2015 Woodside Sale; and Henrietta 4X26 selling to Beaver Dam Farm in that same offer. Henrietta 6045 ranks in the Top 5% for WW, YW, $W, $F and $W, Top 10% for CW. A daughter of the 44 Farms and Jenkins Angus donor 44 Rita 3798, stemming from the herd sire producing matriarch Rita 5F56. Rita 6052 is sired by the Accelerated Genetics and 44 Farms stand out VAR Discovery. Rita 6052 ranks in the Top 5% for YW and %F and Top 10% for CED, CW, Marb, $W and $B. A daughter of the $90,000 valued half interest and top selling female of the 2015 Angus Night on the Mountain Sale, Spruce Mtn Blackcap 4018, and sired by the $250,000 Vintage Angus, Deer Valley Farm and Basin Angus sire VAR Generation. Top 1% YW, $W, $F and $B, Top 5% WW and CW, Top 10% Marb and RE. A direct daughter of the former Woodside and Robert Bahr donor Rita 0243, and sired by the Accelerated Genetics and 44 Farms herd sire VAR Discovery. Rita 6D6 ranks in the Top 5% for WW, YW, CW, $W, $F and $B. A direct daughter of the $140,000 valued Riverbend Ranch donor Rita 9Q15, sired by VAR Discovery. Maternal siblings include the $350,000 valued Rita 12J2, the breeds top MB proven sire Rito 3S10 and Rita 3S8 the $34,000 valued half interest selection of Three Trees Ranch in the record-setting first Woodside sale. Rita 6D68 ranks in the Top 1% for YW and $F, Top 5% for WW, Marb and $B. 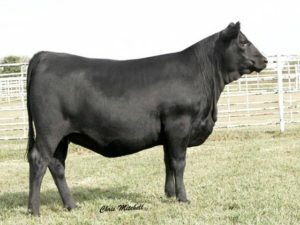 Rita 6578 is an outstanding carcass prospect stemming from the $3.5 million dollar producer, Rita 5F56 and sired by the ever popular 44 Farms, EZ Angus and Vintage Angus Ranch sire Index. Rita 6578 ranks in the Top 5% for $B, Top 10% for WW, YW and $W. 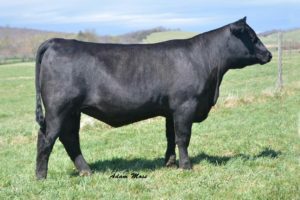 Sired by the popular Vintage Angus, Deer Valley and Basin Angus sire, Generation from the foundation Christmas Eve 3803 in the Spruce Mountain donor program, combining the REA and $B sire Rito 9Q13 with a daughter of the proven growth and CW leader, Upward. Eva D081 was purchased as the top selling heifer pregnancy of the 2016 Angus Night on the Mountain. A direct daughter of the $74,000 valued New Design 0545, sired by the popular VAR Discovery. Rita D128 traces back to the ever popular Rita 6108. A full sibling sold in the 2015 Blackstone Sale selling to Three Trees Ranch for $28,000. Other popular maternal siblings include 44 Peak Value selling to Silveira Brothers as the top selling bull of the 2015 Prime Cut Bull Sale.